Resident of the Portuguese court at Hamburg about the middle of the seventeenth century; died there in 1665. He had lived previously at Amsterdam, where he had taken an important part in the reunion, effected in April, 1639, of the Portuguese community, which, through the rise of the German Jews, had split into three bodies. John IV. of Portugal, discovering Curiel's skill in financial matters, sent him (c. 1650) to Hamburg as his agent, and conferred upon him the title of "Hidalgo da Casa Real" (Noble of the Royal House). 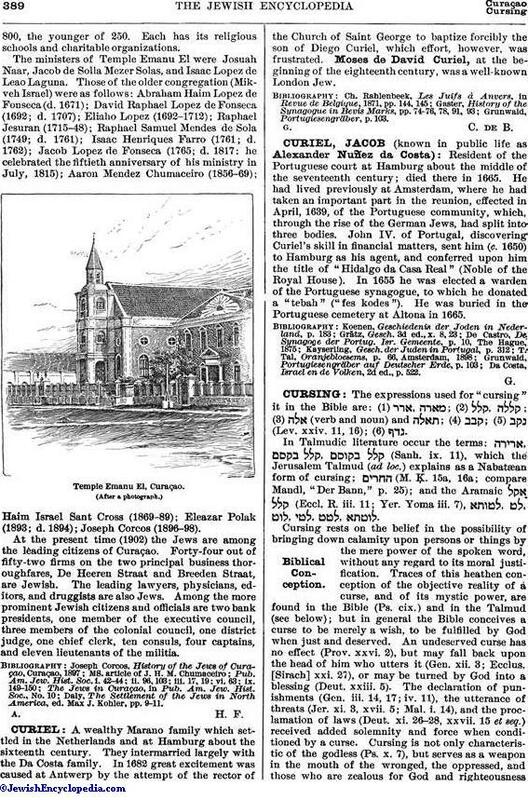 In 1655 he was elected a warden of the Portuguese synagogue, to which he donated a "tebah" ("fes kodes"). He was buried in the Portuguese cemetery at Altona in 1665. Da Costa, Israel en de Volken, 2d ed., p. 522.